"Please note by visiting from this forum, it may make the website look out of proportion." Also you may see some things missing, if you do drop a line on the site, we had some failures upon the merging to the new server. As of now we are working on the PvE Guides to get them all back up and running, which is a merger issue. The site has easier navigation and more thorough access to information. Last edited by Titan_God on Mar 15 2017, 6:44pm, edited 3 times in total. Will definitely check the revamped version when I have the time. I know how much work you put into this titan , it's a great thing for this community. 100% support. I would request that you put links on your site to other guides. My ally guide and CS conversation guide, chocolate's eb and land guides, and all of the other useful ones out there. Let them know some are advance. Remember some people read things differently and how one person explains it may make sense to some but not all. That is why it's good to post the older and relevant guides on your site as well. Or at least a link. -Rusted_Knight_of_Serenity- wrote: I would request that you put links on your site to other guides. My ally guide and CS conversation guide, chocolate's eb and land guides, and all of the other useful ones out there. Let them know some are advance. That's definitely something that can be done, and will look into doing such. Once the pve Guides on site are restored I'll look into that and contact the thread owners for permission to list them. Also I need to see how some things will be working in Tandem with links, they made need to be redone and put into the site. 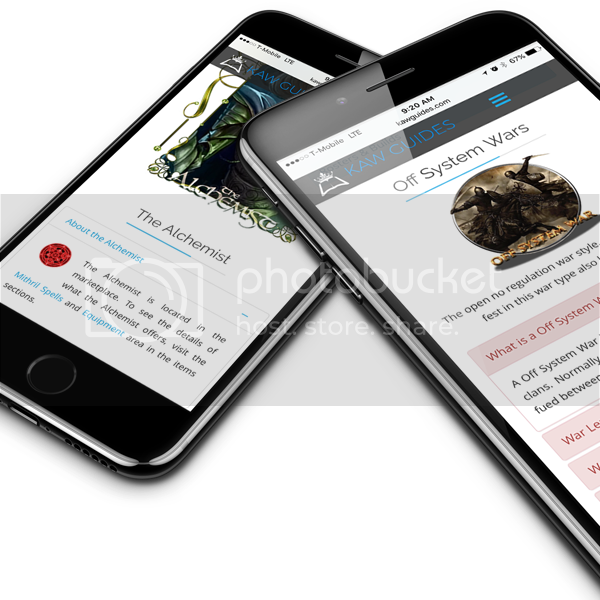 I say this cause at a later time kawguides will be an app available for iOS and android, so links to external sources I'm not sure about using for technical and legal issues. Restored? What's wrong with the pve guides? -Rusted_Knight_of_Serenity- wrote: Restored? What's wrong with the pve guides? Upon merging the database tables became inadequate. For some reason in the sql there is a different couple of variables and instances that changed so those are being reworked right now. Only the calydor series up to Rotb are running once the others are fixed those will get published as each one is fixed. Got yah. Yeah, pve is not my field of knowledge. Lol good luck with that.